Every time we mention doing this trip, we get blank stares from people. 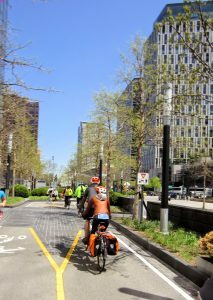 But New York City is one of the most amazing places to ride! Yeah, you should ride with someone who knows their way around the roads and the best ways to get to the myriads of bike paths and cycle-ways throughout the City. 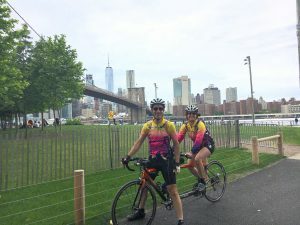 Lucky, we are from the area and have been leading club rides through New York, Brooklyn, Queens and even a touch of the Bronx for several years. We do a ride that we call the “Bridges” that takes people over 16 bridges that span from Manhattan to New Jersey and four of the five boros. So we got thinking that it would be awesome to host a long weekend in New York City. It would likely be in late May or June when the days are longest. We would meet on a Friday and stay at a hotel in Queens. 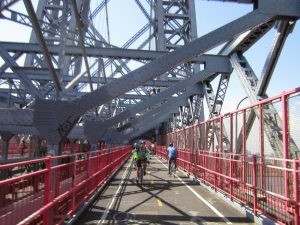 We would do a local ride up through Astoria Queens to the Triborough Bridge (now its called the RFK bridge, but us old-timers can’t get used to that!). 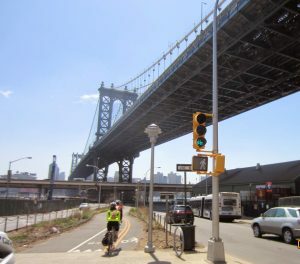 On Saturday we would cycle to the Brooklyn Navy Yard where we would get a tour on bicycle of the revitalized Brooklyn Navy Yard which is now home to movie studios, a craft whiskey distillery and more. 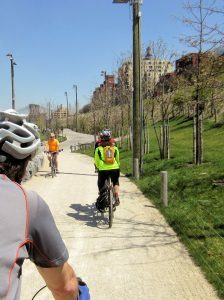 We would also ride to Brooklyn Heights (best ice cream in NYC!) and the DUMBO (Down Under the Manhattan Bridge Overpass) part of Brooklyn. 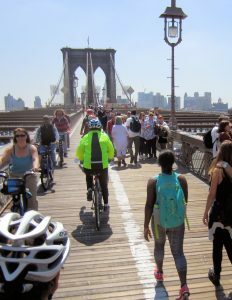 On Sunday, we would ride the bridges to the cycle path around Manhattan, checking out the Brooklyn Bridge, Williamsburg Bridge, Manhattan Bridge and 59th Street Bridge … um, we mean the Ed Koch Bridge (even former mayor Ed Koch was not in favor of that re-naming). We would also ride up to Central Park, Morningside Heights, Columbia University and St. John the Divine Chapel. 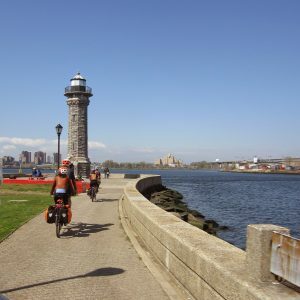 On Monday morning we would ride over to Roosevelt Island where there is a lighthouse, an abandoned Typhoid Hospital and the FDR Memorial (we call it the FDR Floating Head Memorial. You’ll know why when you see it). Pretty cool stuff! All of the rides for the weekend would be Leader Led Rides where we ride as a group. We would also give out the directions on cue sheets and also on GPS files. Let us know if you would be interested in this adventure!